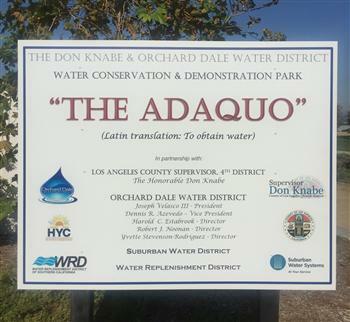 Orchard Dale Water District is honored to partner with the Water Replenishment District, Suburban Water Systems, and with Supervisor Don Knabe's Office of Los Angeles County to support this large Water Conservation Demonstration Garden. The sign honors those organizations and individuals that were directly influential in the success of the water conservation garden. The Liberty Community Plaza is located on the corner of Valley View and Telegraph Road in the unincorporated area of South Whittier. The Board of Directors of Orchard Dale Water District have taken this opportunity to give back to its community by showing an ongoing interest in the care of the Veteran's Freedom Garden, and the preservation of the conservation garden throughout the property. The eloquent facility and grounds are managed by the dedicated staff of Helpline Youth Counseling. Our customers, families, veterans, and children now have a wonderful campus to enjoy. We hope this exciting onsite water conservation feature offers our customers ideas on design, plants, and hardscape opportunities for our community, ENJOY!